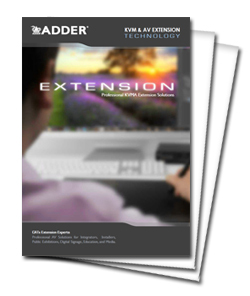 The AdderLink X2-Silver Dual Access KVM extender extends high quality video, keyboard, mouse and transparent RS232 up to 300m/1000ft over Category 5 or higher cable while providing KVM access at the computer for local as well as remote control. The X2-DA-Silver offers increased distance over which video can be transmitted and the high resolutions that can be achieved at these distances. This CAT5 extender achieves resolutions of 1600 x 1200 at 200m/650ft and 1280x1024 at 300m/1000ft. Integral electronic DeSkew is also provided to compensate for any color skew effects that may be introduced by long CATx cables, achieving crystal clear video, even at longer distances. All video adjustments may be made using the keyboard. Spike suppression - The X2-Silver Dual Access is fitted with spike suppression circuits. Application - The X2-Silver Dual Access is not suitable for linking between buildings. Display Data Channel - DDC signaling is supported to enable the computer to communicate with the monitor and thus configure its video card for optimal operation. 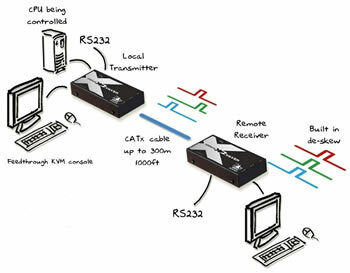 RS232 Transparent serial port operation ensures wide device compatibility without the need to configure baud rates or protocols on the X2 to match your equipment. Adder X2-DA-SILVER-US is also known as X2-DA-SILVER, X2-DA-SILVER/P-US, and X2-DA-SILVER/P. Question: Can I use the X2-DA-SILVER-US (One) Local with two remotes and, would each remote will have their own access to the local computer/server? I am replacing a now obsolete AdderLink X-Series - X-KVM/R (One local with two remotes) with a similar KVM extender. This X2-DA-SILVER-US is very similar to the AdderLink X-Series, but the second user would be a local user and would not use a seperate receiver. Depending on your application, we may have other options for you as well, for example IP based solutions- Please feel free to contact your KVM Switches Online sales representative directly!